The Sigma 35mm F1.4 scored 17 P-MPix for sharpness and an overall DxOMark score of 30.3 putting it at the top of both of these rankings for a 35mm lens. Taken individually, among the 35mm lenses available for Canon virtually all measures, show the Sigma as the equal or better of the group, its score positions it as one of the sharpest lenses tested by DxOMark on Canon mount. Most photographers buying a lens will look first at the offerings that the camera maker has, Canon lenses for a Canon Camera. Then they will buy what they can afford. This Sigma 35mm f1.4 DG HSM A would make this a very bad strategy. With higher sharpness, lower distortion, better transmission and lower chromatic aberration than its main rivals. Only in vignetting does it fail to excel, having a 2 stop fall off in the corners when used at full aperture, though this is also true of the others. It is not just in the sharpness scores where the Sigma excels: the DxO Mark scores place the Sigma at just over 30, the f2 Carl Zeiss lens at 27 and the Samyang f1.4 lenses at 26 and 23 respectively. 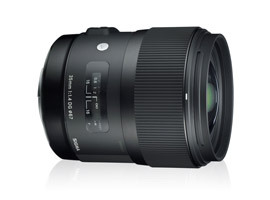 From a price perspective the Sigma is the second cheapest of this group, about 50% more than the Samyang 35mm f1.4 AS UMC. However, the Samyang, like the more expensive Carl Zeiss Distagon T 35mm f2 and the much more expensive Carl Zeiss Distagon T 35mm F1.4 ZE lens is not fitted with an autofocus motor which the Sigma and Canon’s own EF 35mm f1.4L are. P-MPix relative to price for 35mm lenses mounted on a Canon EOS 5D MkII. The Sigma, alone at the top and well away from the right hand end of the graph is a real star! When you add to this that Samyang’s 35mm lens fails to deliver anything like the sharpness and loses about 2/3 of a stop of transmission: it does not look like such a bargain. In build quality the Zeiss lenses have a great feel, using traditional materials in a way that is likely to mean they will retain their value well. The performance of the Zeiss lenses is very good but even the version at f2 is still more expensive than the better performing Sigma. It is clear that Sigma has done something very special with the 35mm f1.4 DG HSM A, they have produced a lens that performs better than Canon’s own 35mm lenses and better than a Carl Zeiss 35mm f1.4. When an independent manufacturer’s lenses can do this, it must make the customers think carefully about their buying decisions. It is also good to see a manufacturer recognise the demand for optics that provide pleasing bokeh and to address this specifically. There are really only two contenders where 35mm lenses for Canon are concerned. If you want the best then Sigma is the choice for you and if you want a bargain, then Canon’s EF 35mm f2, launched in 1990 could be a good alternative.